If you use Google Reader to follow your feeds Reeder is an absolute must. I cannot say enough good things about this app, especially on the iPad. If you have an iPad you owe it to yourself to get this app. 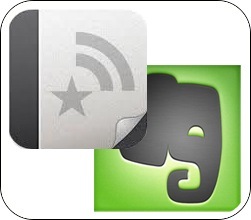 And if you want to keep track of all the cool things you find from the feeds, download Evernote right now!!! You can grab sites, clippings, make audio and video notes, or just about anything and organize it away for later. Best of all they all sync between your devices; make a note on your iPhone and it's on your Mac, SWEET!!! THE HOBBIT!!! » « 2012 It is time to start this up again!! !